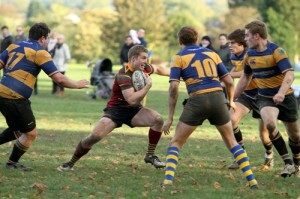 Norwich Rugby Football Clubs great form continued as they travelled to play Upminster, in some tough Autumn conditions. With a sloped pitch and the wind blowing strong, despite losing the toss, they were asked to play with the elements in the first half. 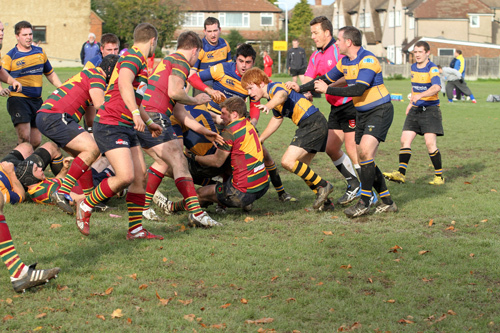 Seeing this as an opportunity, they pinned Upminster back in their own half, which paid off as a penalty was awarded for an infringement in a scrum, which Rob Micklethwaite converted. Just as Norwich had found their stride, an unfortunate injury occurred, as an Upminster player gashed his leg, most likely on a sharp object being on the pitch, forcing the match to be moved to the narrow spare pitch. Norwich didn’t adapt to the different pitch very quickly, still using the wide areas a lot, but on such a narrow pitch made it easy for Upminster to defend. Despite the best efforts of both sides, and good individual runs, neither side could score, stalemating the game. 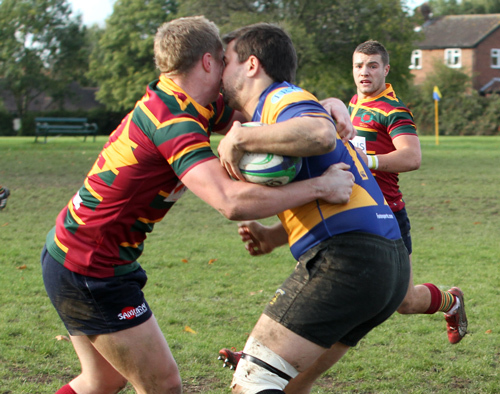 However, a penalty was finally awarded for an offside, which full back Rob Micklethwaite made no mistake by scoring, although he did later miss one when an Upminster player was penalised for standing in front of the kicker. 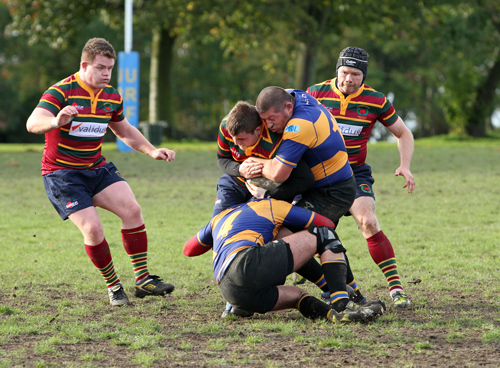 The restart kick fell straight to George Pope, who despite being nearly 40, started a great attack, gave it to Freddy Cook, who worked space for Clark Hindle to dive over for the try. 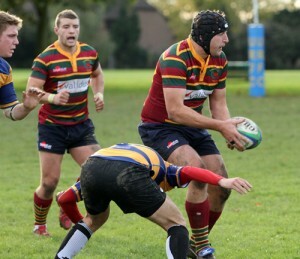 Rob Micklethwaite missed; as Jamie Pavent of Upminster then went on to score a penalty on the stroke of half time. The home side scored first after the break with another penalty, which stimulated a response from the Lions, who applied some great pressure in their scrums through youth product Lewis Ball, stepping in as prop. The lessons learnt during the season so far are starting to show, as Norwich’s build up play was very patient, not trying to force play, which saw Ives and Wheater, work well together to drive forward and reset, until the time was right to give to Swanborough to score. Next stepped up Scott Hancocks, who like his super hero name share, showed his amazing speed to penetrate the Upminster defence and score again. The resulting conversion was missed. 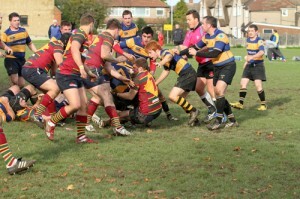 Upminster responded with great spirit, but the Norwich defence stood strong, turning the ball over frequently for the away side to attack again. Norwich will feel a little a disappointed they didn’t have two more tries, as a scrum was forced over the home sides line, then collapsed only for the ref to deny it, then Hancocks was passed the ball as he scored, only to be told it was a forward pass. Norwich’s form of late has been good, but tough games lay ahead. How long can they keep it up for? Anglian Home Improvements helping support the community. Visit our homepage for information on our products.